Amazon promotes the Echo Dot, its hands-free, voice-controlled device that uses Alexa to help you with various things, in a hilarious new commercial, focusing on the device’s new feature that allows it to be used like an intercom system inside your house. 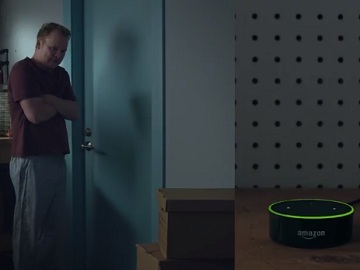 The spot features a guy locked in the garage on a winter night asking Alexa (Amazon’s intelligent assistant, which is built into its Echo gadgets) to call the living room. “You’re locked in the garage again.” – a woman’s voice is heard saying, but he denies it. Amazon Echo Dot uses Alexa to play music, make calls, send and receive messages, control smart home devices, provide information, read the news, read audiobooks from Audible, set alarms, control Amazon Video on Fire TV, and more. This (long-awaited) intercom feature, introduced earlier this year, can be accessed also via the Alexa smartphone and tablet app, which means that you can call persons directly on their Echo speakers. To set up an Echo as an intercom, you have to go into the Alexa app or settings page and name it based on the room it’s in and then, enable the Drop-In feature via the Alexa app within your household group. This gadget is available for purchase for $49.99.